lawyers under the aegis of Lawyers In Defence of Democracy and some civil society groups opposed to last Friday’s suspension of the Chief Justice of Nigeria, Justice Walter Onnoghen,by President Muhammadu Buhari ,took to the streets of Abuja, yesterday to register their grievances. 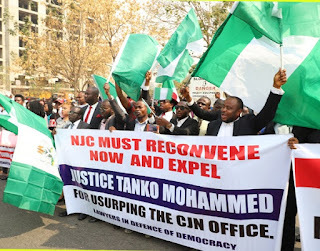 Before pouring into the streets,the protesters marched to the national office of the Nigerian Bar Association,NBA,and the American Embassy, in Abuja to register their displeasure over the president’s action. The developement caused traffic gridlock in some major streets of the Central Business District area of the FCT,thus giving the police personnel deployed to monitor the situation tough time to control. He alleged that” President Muhammadu Buhari relied on and used a forged and fictitious Tribunal Order to purport to suspend the Chief Justice of Nigeria and appoint a factional Chief Justice while knowing that the Order was forged and fictitious. He added:” From the above dates, it will appear clearly that upon receipt of the Petition, the first action of the Bureau was to file a Motion Exparte asking that the Chief Justice should leave office and that Justice Tanko Mohammed be sworn in even before commencement of investigation into the matter, even before the Chief justice was approached to make a statement and even before charges were filed against him. “Our sources inform us that there was actually no exparte motion filed on 9th January, 2019 in the Tribunal. What we have been informed that happened was that following the several orders of the Federal High Court, the FCT High Court and the National Industrial Court all of which the Tribunal claimed to have overruled on its last sitting on 22nd January 2019 and the order of the Court of Appeal on the 24th January, 2019 directing the Tribunal to stay proceeding, the Presidency directed that the Motion Exparte be filed and backdated and put in the file of the Tribunal and an order drafted immediately and served on the President immediately. ” Our source says the entire processes of the filing, hearing and granting of the order of the Tribunal were started and ended from Thursday 24th January, 2019 to Friday 25th January, 2019. “Elementary knowledge of law teaches that when the jurisdiction of any Court or Tribunal is challenged, it cannot take any other steps until it rules that it has jurisdiction. How then can the Chairman of the Tribunal claim to have granted the Order removing the Chief Justice on 23rd January,2019 when on 22nd January he already set down for hearing a motion challenging his jurisdiction and also a motion on notice for the same purpose as he purportedly granted in the Exparte. “As far as there was a motion challenging the jurisdiction of the Tribunal, it had absolutely no jurisdiction to hear any other motion let alone grant same without first dispensing with the Motion challenging its jurisdiction. “Anything done by a Court or Tribunal without first deciding on whether it has jurisdiction or not is ultra vires, unlawful and done without requisite jurisdiction and cannot stand. The Presidency could have only gotten the Tribunal Chairman to do this by drawing the leash they have on his neck which is the criminal charge filed against him at the Federal High Court. That charge is now their weapon they utilize to get the Tribunal Chairman to do anything and everything they want, no matter how despicable. “The President has viciously, brutally, ferociously and gruesomely violated the Constitution which he swore to uphold. This is an act that amounts to gross misconduct and it most certainly warrants his removal of office. The National Assembly should as a matter of urgency, national importance and patriotism commence without any delay the impeachment process of the President. Speaking further,he said:” They rejoice for they say they have conquered the security agencies and can get them to do anything, they rejoice for they say they have conquered the INEC, they rejoice for they say they have conquered the judiciary, our last hope! They rejoice for they say they now knock on the door of our last symbol of democracy, the Parliament, which they will pull down its door if we do not open the gates and hand the Chambers over to them! Nothing is sacred to them anymore. He told the protesters:”Fellow compatriots, I implore you this day, stand firm for we shall overcome. We shall recover our country. They have judged us wrongly. They have misjudged the strength of our character and our resilience. They shall realize that the power of the people is mightier than the people in power. They have desecrated our judiciary! They have violated our last hope! They have defiled our temple of justice. With a stolen order, with a forged paper they hurriedly invaded the sanctuary, but we shall not let them.